Read the instructions carefully to familiarize yourself with the rules. You might also print out the Spanish color names (see “Make it Better”). Ask your students if they have ever played tag before. What are the rules of tag? What is the goal? Do any of your students speak Spanish, or know any Spanish words? Can any of them name some colors in Spanish? Tell them that you are going to play a game called “Color, Colorcito”, which is a game that children in Spain sometimes play. “Color, Colorcito” means “color, little color”, and the game is usually played outdoors in a park or schoolyard. Play this game of tag from Spain and see how fast you and your powers of observation are! This game is played with the entire group of children together, and is best played in a large space outdoors, though you could play it in a large indoor space as well. Before the game begins, stress that children be safe, as they will be running around. The rules of the game are simple: The players take turns being “It”, the one who has to tag others. The It Person says “Color, little color” and then names a color. The other players have to run to find something that is the color that was selected. 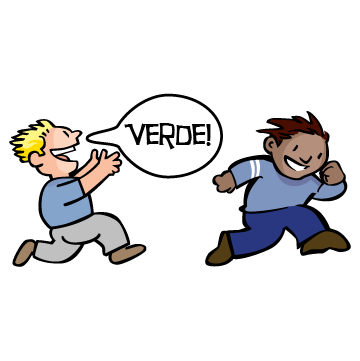 The It Person runs after the other players and tries to tag them before they can touch the colored item. If the It Person tags someone, that person is out. The game continues until the It Person has tagged everyone, then a new player becomes the It Person. Play the game in English for a few rounds, then gather children together to talk about the game. After playing a few times, gather everyone together to talk about the game. Was it easy or hard to find the different colors? Do they think they could play the game in another language? Tell them that you would now like them to try the game in Spanish. Play the game again, but this time in Spanish. Instead of saying “Color, Little Color”, the person who is “It” should say “Color, Colorcito”, then name a color in Spanish. See the list below of colors and their Spanish translation. You might want to print this list out or write it down for reference. If your students do not know any Spanish, choose 2 or 3 colors to start them out with, then gradually introduce new colors. If you have students (or parents) who speak another language, you can try this game using that language. Ask them to list the colors for you in their language, then play the game. Another way to play the game is to choose a “safe” object, like a rock or a tree or a fence. When the It Person names a color, the players have to find something that is that color and bring it to the safe object before being tagged. This variation of the game might be better in an indoor play space. Games of tag are played all over the world, always with unique rules and features that make them different from how they’re played anywhere else. In Brazil, some children play a game called Queimada, in which players pretend they are in a cemetery and when someone is hit with a ball they are “dead”. In Saudi Arabia, the person who has to tag other children is called “the hunter.” In Korebe, from Turkey, the person trying to tag others is blindfolded, and in Taiwan, the game is played as an eagle chasing chicks.